UPDATED: I want to add what I shared at the Operation Write Home facebook. 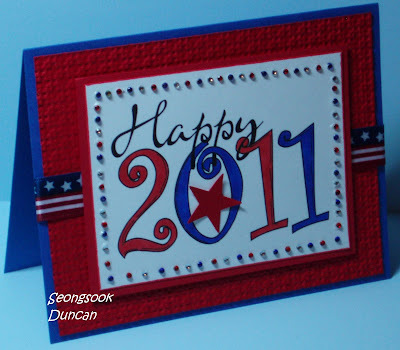 The question was "What's your cardmaking goal for our heroes this year?" Thanks very much for asking so that I can make it open and real! Personally, I will make a card for the Operation Write Home for each comment on my blog posts. I will randomly pick a commenter at the end of every month for my blog candy. It's a small token of appreciation for your support for the Operation Write Home. Publicly, I will keep hosting an OWH Cardmaking Party on every 2nd Sunday of the month at Elk Grove Grocery Outlet from 1 p.m. to 4 p.m. with my OWH Cardmaking Group. We made about 1,500 cards in 2010 and we will make definitely make more with more new participants. There is one more thing that I want to add. Since I love the Stampin' Up! products to make cards for heroes, I signed up as a demonstrator to get discounts. I am going to donate any sales profit from my Stampin' Up! website to the Operation Write Home towards their shipping cost. I hope this will not cause any conflicts with other Stampin' Up!demonstrators. Please let me know if you have any concerns. The more I read our heroes "Heartfelt Thank You Notes to OWH Cardmakers", the more appreciation for their services grows. I do really believe that ""There is no limit to what a man can do or where he can go if he doesn’t mind who gets the credit"
Brilliant card, it really stands out. Happy New Year. Wonderful! I became a follower! Happy 2011! Hello Seongsook. Have come to you via Feline Playful and am now a follower too. Love your blog candy idea. Happy New Year to you. I wish you all the best. Today is the first day for Feline Friends. Became a new follower. The PERFECT New Years creation! I too have come by as your new Feline Friend and hope to stop back often! Happy New Year to you, too, from a fellow Feline Friend. Found your blog with the Feline Friends ! Love your card and became a follower at once ! I really have to commend you for all your hard work on behalf of OWH. You are an inspiration to us all! Love the fresh colours of this happy card! Happy new year and a toast at a creative 2011! I am now a follower,great blog this card is fabulous so crisp! Such a great card! Wonderful new year's card. Came to you via Feline Playful. This is so cute, love the star in the zero!!! Great card! I love the bling. Happy New Year! i am becoming a follower. Hiya hun, lovely bright crad perfect for New Years. found you through feline playful and will be back for sure. Hi! Found you while Playing along with the Felines. Just love your New Year card. Hope it's a very happy one for you. I'll look forward to visiting often. Love your card. Landed here through feline playful. Will definitely be back!!! Love the cheerful card! Visiting from Feline playful...now following too. Happy new year! Wonderful Card. Happy New Year. Happy New Year, what a colourful card! Came here over Feline Playful. I make cards for OWH too. My goal is 365 this year, one per day. Cruising by from OWH on FB, nice cards! having a look and what you are doing for the troops is fantastic!! Your cards are amazing!! Am now a Feline follower too!! Hi there, im another Feline buddy. Love your designs and will watch your blog as a follower! Great card, I'm a new follower, can't wait to see what you have in store for us. Happy New Year! Happy New Year and HAPPY crafting!! I'm one of the Feline gals and happy to already be one of your followers!! What a very colorful lovely card. Hugs from the Feline playful blog share. What a bright, cheerful card! So pretty. Happy New year. Cute blog.. came over from Feline..happy 2011. Love your card! I'm looking forward to getting to know you. Found you on Karen's blog post "Give a comment, Get a comment". So I'm making my rounds. I hope you'll come visit me too Happy New year!! What a fabulous card! I am a scrapper, but really appreciate the work that went into this card. I stopped by from Feline Friends and am now a follower. I found your blog on feline playful. Fun card!! I'm a new Feline follower! Happy New Year! OH my GOD! Love he colours! Absolutely LOVE the card! I love this! Thank you for the bright and cheerful colors! Hi Seongsook....I'm a Feline buddy too....love your work....became a follower! What a bright and cheerful card for the new year! Came to visit from Feline Playful! Came to visit through Feline Playful and love your card the clean & simple design is excellent! Vil gerne følge din blog. Very pretty! Love the colorrs that you chose and the bling is awesome! I am a day late - sorry didn't realize the Feline Playful fun started right on New Year's Day. But joining in the commenting and following today- great blog! Arrived here via Feline Playful. CAS colorful card. Lovely! Terrific Card! I found your blog throught the Feline Playful "give a comment, receive a comment" game. I hope you'll remember to stop by mine too! I like your 2011-card!!! I came over from Feline Playful! I found you through Feline Playful and became a follower! Found your blog through Feline Playful and have become a follower. You are amazing to do such a wonderful thing for our soldiers! Hugs! !